Spine, a photo by Neil Hobbs on Flickr. 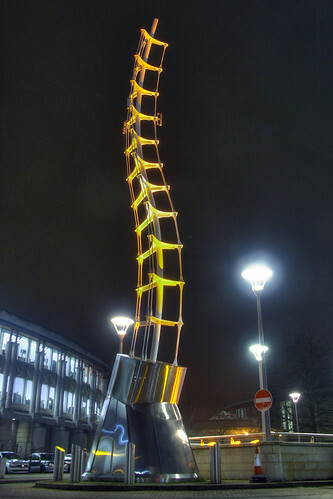 The Spine, illuminated at night. ... the design is by student Chee Horng Chang and is called "Telespine". Chee Horng Chang was intrigued by the Orange Millennium Landmark Initiative brief. “I based my design on a sound wave, creating a physical representation of the fundamental element of any communication,” he remarks. He took a very original approach to his design, using an organic structure to create a striking landmark.